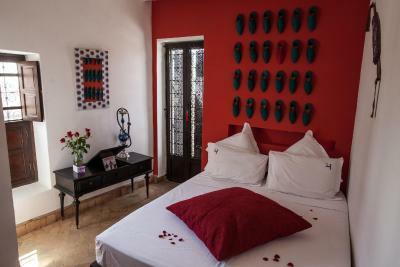 Lock in a great price for Riad Houdou – rated 9.6 by recent guests! The owners, Didier and Eric painstakingly refurbished this Dar ~6 years ago. Didier was incredibly attentive, both in emails leading up to the trip and during our stay, even giving us an orientation tour by walking us to the main square. Abdel, their manager, is the model of attentiveness..., he is exceptional. The other staff were equally cheerful and attentive. If we come back to Marrakech, we would return to Houdou. Very nice staff, always willing to help. The breakfast is typical and very complete, delicious. Great hospitality. We were warmly welcomed and oriented to the streets outside. Always willing to help us figure out how to navigate. Fabulous sun-deck to relax on after crazy outings. Best of all, we took their mule ride up to mountains. Unique experience, breathtaking views of little towns. Highly recommend! We received such a warm welcome. Everyone was kind and helpful. The Riad is lovely. 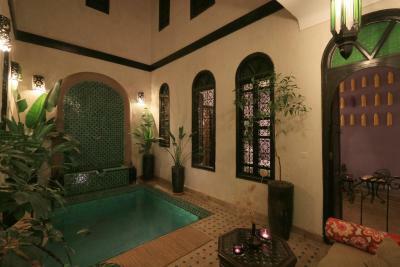 Beautifully restored historic Riad. Helpful staff. Great food and location. Would definitely recommend staying here. It's a beautiful riad and the staff couldn't be more friendly. 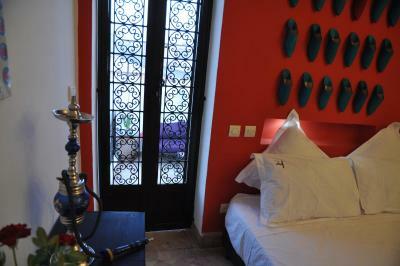 Fantastic Riad, staff were excellent, very helpful and personable. 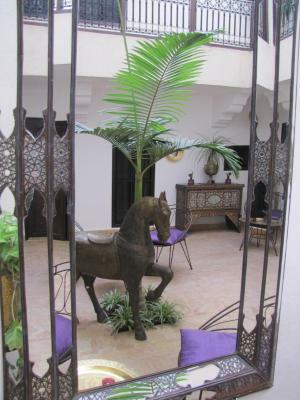 The Riad is very peaceful inside and it it very well decorated and very clean. Breakfast is nice, the yogurt that is served with a different fresh fruit everyday is lovely. Special shout out to Abdul, the manager of the property, who made the introduction to the property and the medina really well. 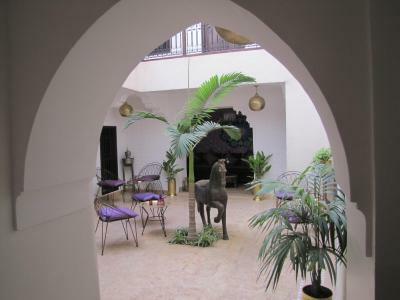 The property itself is centrally located in the Medina, very easy and safe to walk around. Room is cozy (different style deco across rooms), and breakfast is delicious to kick off everyday life. Marrakech is intense by all means, but this riad makes you quickly indulge into the environment with ease. Enjoyed the stay, and a heartfelt thank you! I liked the interior design, it was a relaxing environment to be in. 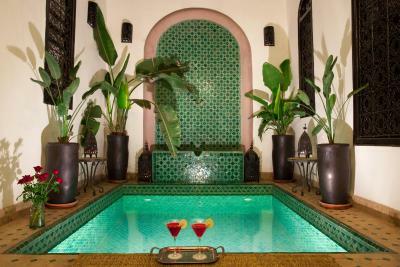 Built in a traditional Moroccan style this guest house is located in Marrakech. It offers a swimming pool, and a roof terrace with views of the Atlas Mountains and Koutoubia Minaret for breakfast. 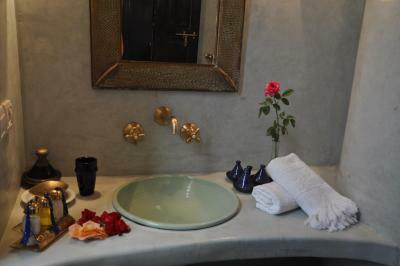 Each air-conditioned room in the Riad Houdou has a private bathroom and free Wi-Fi. Some rooms have a balcony. At the Riah Houdou, guests can enjoy Moroccan cuisine in the restaurant. Afterwards guests can relax in the tearoom, lounge rooms or library. There is a garden and patio, which is decorated with fruit trees. Massage and beauty treatments are also available. Under extra fees, a parking is available 10 minutes walk from Riad Houdou. 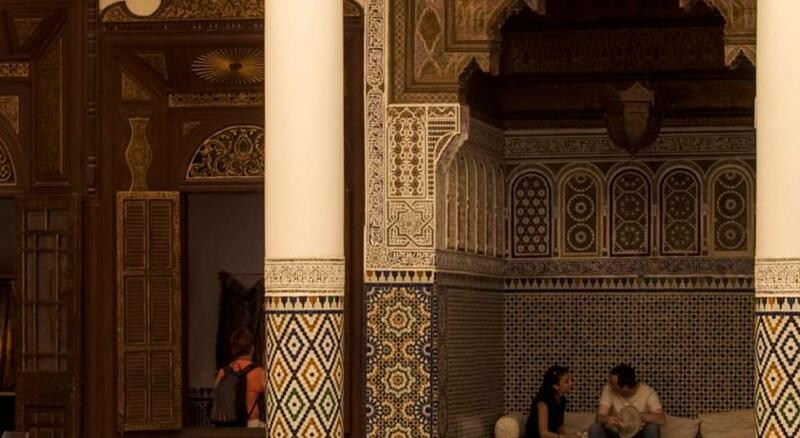 As the guest house is placed in the heart of the historical district, it is close to the Medersa Ben Youssef, Marrakesh Museum and the famous Jemma El Fna Square, which are all just a few minutes away from the guest house. 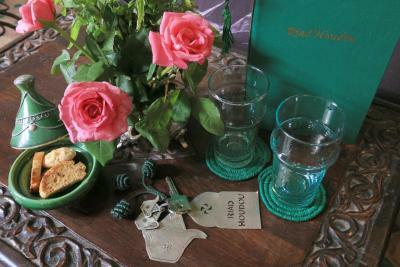 When would you like to stay at Riad Houdou? Featuring a lounge with fireplace and a 4-poster bed, this spacious suite is decorated with spice pots. The Tadelakt bathroom includes a large bathtub, a shower and 2 sinks. 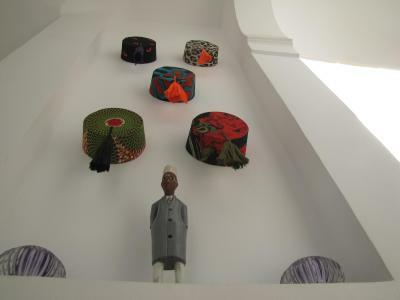 Set on the first floor of the riad, this room is decorated with a series of fez hats spread over a pistache-green wall. 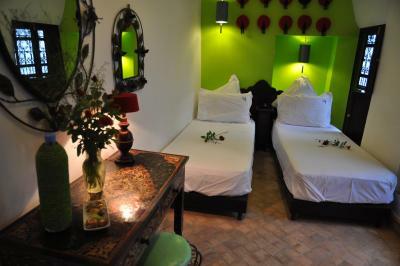 Additional facilities include a desk, a traditional-style chair and a Tadelakt bathroom. 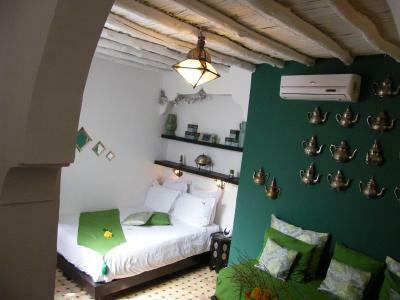 Decorated with Tajine's spread over a green wall, this room features antique furniture. It offers a furnished balcony. This double room has air conditioning and fireplace. The Tadelakt bathroom includes a shower. Extras include a private patio with a hot tub. 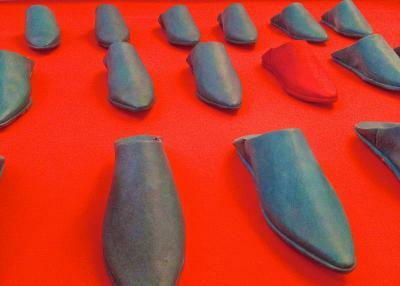 House Rules Riad Houdou takes special requests – add in the next step! Riad Houdou accepts these cards and reserves the right to temporarily hold an amount prior to arrival. At Riad Houdou, there is a 5% charge when you pay with a credit card. Please note that cleaning services are daily and included in the room rates. Please note that Alcohol brought by guests is not allowed within the property. Please inform Riad Houdou of your expected arrival time in advance. You can use the Special Requests box when booking, or contact the property directly using the contact details in your confirmation. Staff and owners very helpful and available in the Riad all day to offer advice or answer questions. The reception process was particularly good, they took a lot of time to make me welcome and explain how to get around. Will come back again on my next visit. What a place! A beautiful calm Oasis in the middle of a crazy city. Eric and Didier and the team were on hand to answer any questions that we had and to help in any way that they could, from recommendations to maps and apps and organisation of transport. The Riad itself is a beautifully renovated, coolly decorated, spotlessly clean old house with lots of hang out and relaxation spaces including the fabulous roof garden with pool. The breakfast was a delight and there are also drinks and snacks available throughout the day. 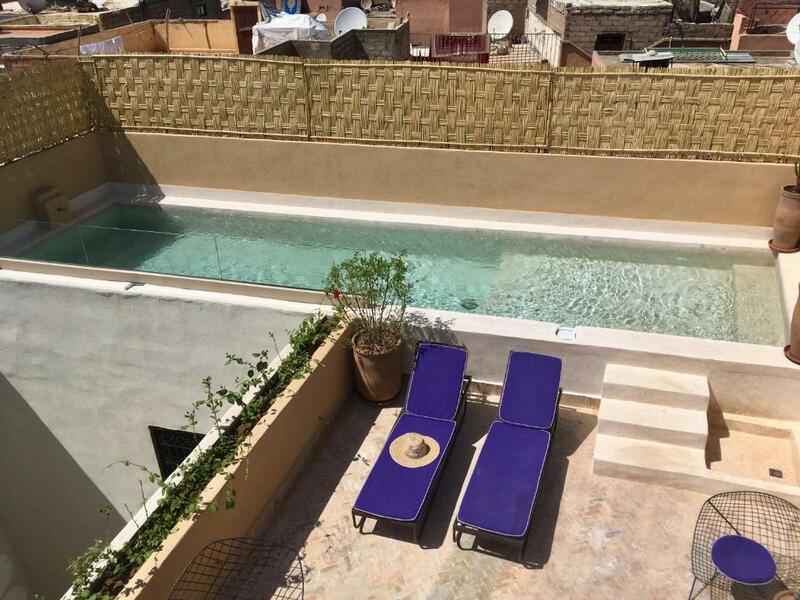 We would absolutely recommend Riad Houdou and would stay again! If you have a low tolerance to noise perhaps ask to be given a quiet room. Ours, the Fez room, was right by the stairs leading up to the terrace and above the evening dining area so we could hear a lot of footsteps and chatter first thing in the morning and well into the evening. A pair of earplugs fixed everything though! The bathroom could have been a little cleaner but the toiletries were of a high standard. Didier, Eric and their staff were wonderful. True hosts. On our first day Didier walked us to the main square to ensure we wouldn’t get lost in the Medina. Eric was kind enough to give me a Gaviscon to fix a pepper-induced indigestion! Breakfast on the terrace was nice with great views over Marrakesh and the Atlas Mountains. There was a very calm atmosphere in the internal courtyard, with two turtles roaming about in between orange trees and a beautiful old fountain. The only downside is not being able to pay for extra services and dinner with credit card. It has to be with cash. We probably would have had booked more spa services (massage, mani/pedi) and purchased some products had we been able to pay with credit card. We were at the end of our stay in Morocco and did not want to withdraw more MAD. Everything! The location is great because it is a short walking distance to everything. We were 2 women traveling together. We were met at our taxi and brought to the Riad. We were even escorted part of the way to Jemaa el Fna our first night to help us get oriented to the area. The staff are beyond helpful; they were always smiling, engaging and sincere. The food is spectacular. We stayed 3 nights and breakfast was different everyday and it was delicious! A good mix of traditional food, fruit, dairy and 'western' breakfast. We also had a dinner that was well worth it. It was pouring rain that night and we were exhausted and not wanting to head out for food so it was so nice to have that option to dine in. The dinner was well done and the ambience was excellent. The interior decor is tastefully done and it really is an oasis away from the chaos of the Medina. The rooftop has nice views of the Medina and the Atlas mountains and there is a small pool to dip in. We tried the Hammam and were very happy with the service we received. 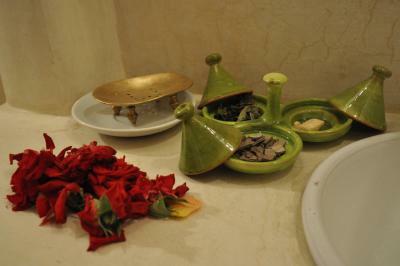 We had done a public Hammam in Fes and so this is different from a traditional experience but still superb. The Riad itself is quiet and peaceful and has a great energy about it. Love the turtles! Everything was clean and well maintained. Filtered water is available at your disposal which was really nice. We had questions prior to our stay and the owners were quick to respond to our questions via email. I would choose to stay here again in a heartbeat; I would not hesitate to recommend this Riad to everyone I know. The staff were amazing, so friendly and helpful nothing was too much trouble. The lunches we had were great. It was a comfortable room with great facilities. While some people want to save a bit of money doing their own transfers, PLEASE arrange with their staff to get you both TO and FROM Riad Houdou. You will avoid a LOT of unnecessary stress, and in the grand scheme of things, it only costs you peanuts more (~150 dihram to and from the airport). We took the transfer to Houdou which was great, but on the way back to the bus station we got cheated by a teenage boy that was 'helping' us find a taxi who demanded 50+ dirhams..., it got ugly very fast. An arranged transfer would have alleviated all of that! Bottom line, pay the few extra bucks and your experience in Marrakech will be magical. Eric was very welcoming on arrival and the staff were excellent. 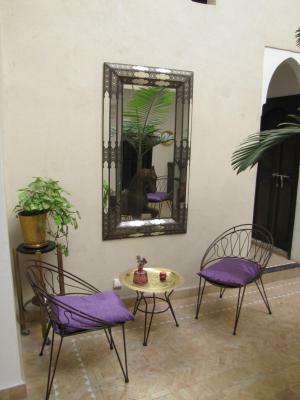 The Riad was spotlessly clean and quiet and a welcome oasis in Marrakech.